There is a great wealth of numerical and experimental research dealing with the seismic response assessment of new steel moment resisting frames (MRFs). Such research has shown that: (i) the seismic behaviour of MRFs is largely influenced by the behaviour of the joints; (ii) the loading protocol adopted to qualify/test beam-to-column joints are representative of the cumulative and maximum rotation demands imposed by far field natural records and (iii) the design of new steel MRFs according to EC8 is mostly influenced by the serviceability checks (i.e. damage limitation requirements). It is worth noting that most of the existing studies conducted in the past focused mainly on sub-assemblage tests, without accounting for the response of the building as a whole. Additionally, the loading protocols used for qualifying the joints do not mimic actual earthquake demands at near-collapse conditions. This is also the case of Near Fault (NF) seismic input. Importantly, there is a lack of knowledge about the behaviour of steel joints when subjected to near fault seismic demand. Moreover, earthquake reconnaissance studies have shown that the ratio of vertical-to-horizontal peak ground acceleration can be larger in near-fault than far-fault seismic events. Near fault strong motions tend to increase the inelastic demand on structural steel members and joints. On the other hand, the use of special ductile energy efficient claddings can be beneficial to relax the drift limitations, thus allowing to optimize the structural design (i.e. reducing the design over-strength), reducing the material consumptions, the constructional costs and encouraging the use of more sustainable solutions. The use of such ductile non-structural components will also lower the earthquake-induced losses arising from the claddings. The project FUTURE aims at investigating the seismic response of steel MRFs accounting for different types of pre-qualified beam-to-column joints as well as the role of ductile claddings under NF earthquakes. To this end, comprehensive shake table tests on specifically conceived mockup have been planned. The mockup consists of a 2 storey steel MRF (5.5m x 5.5m) sub-structured from a reference archetype building. The sample specimen is equipped with special energy efficient and extra-ductile façade cladding. Three types of bolted beam-to-column joints will be tested, namely haunched, extended stiffened and dog-bone. The sample mockup is also designed to detach and to replace easily all plastic components, which correspond to the portions of the beams with plastic hinge and the corresponding end-plate connections. The joints will be designed considering strong column web panels, so that the column components remain elastic during the whole test campaign. The experimental program consists of two phases, each of them repeated three times (i.e. one per examined type of beam-to-column joint). In the first phase, the entire mockup (i.e. 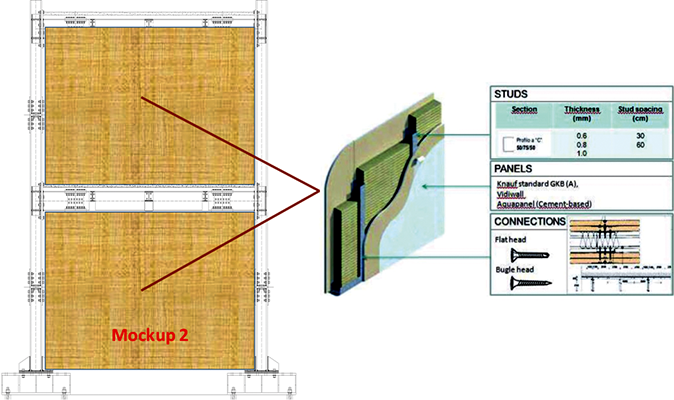 frame + claddings) is subjected to base ground motion incrementally increased to cover Full Operation (FO), Damage Limitation (DL/ SLS) and Significant Damage (SD/ULS) earthquake intensity levels as defined in the new draft version of Eurocode 8. In the second phase, after the removal of the cladding and the substitution of the base columns (if damaged), the damaged joints are replaced without mounting new cladding and the acceleration is incrementally increased up to Near collapse (NC) earthquake intensity. The experimental campaign will be supported by comprehensive numerical analyses of the entire mockup and its components to simulate both the pre- and post-test conditions. The project intends to develop design rules for the fully detachable dissipative zones (i.e. 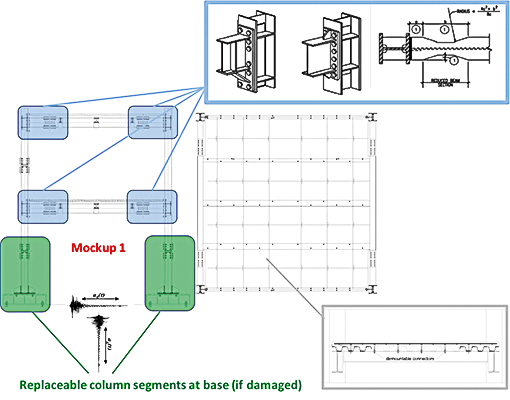 the beam segment containing the potential plastic hinge and EU pre-qualified end connection) and provide guidelines for the reliable evaluation of the earthquake response of steel structures, with the presence of ductile claddings.